After pondering various topics of interest in our field with Chris Miracle, Design-Build PPN Co-Chair, and reflecting upon my experience as a landscape architect, both in the pure design field and now in the design-build industry, I had an epiphany on an important subject to be discussed. I believe that as we move forward in our professional careers, we need to reflect back to the father of landscape architecture, and the works of Frederick Law Olmsted. Central Park, his iconic piece of work, was and is currently a true treasure. If we distill down the concept of Central Park, it was a response to a strong social need at that time in the history of our country. Somewhere along the course of his career and the spawning of landscape architecture, the narrative of landscape architects being stewards of the land became prevalent. I would like to take a few moments and reflect on this concept of stewards of the land, and stewardship in general. As landscape architects in the design-build sector of our industry, stewardship is an ethic that embodies the responsible planning and management of resources. One of our largest resources is the landscape, and as landscape architects we truly are the stewards of this land. It seems in our industry that we typically want to work with the ideal client that fits our specific needs; at times, it is the individual with a higher income and resides within prominent neighborhoods. I have been very fortunate to have been involved in various high-end residential projects as well as some wonderful design-build commercial projects throughout regions of Wisconsin. As a business owner, my ideal candidate has historically been this type of client, but last year I was invited to bid on work in a city in the Midwest in which I was unfamiliar. I was very reluctant to bid on the work because the city was starting a new program to create stronger neighborhoods in blighted and rundown areas of the city. The intent of the city planting was to encourage additional green space within these blighted areas and to “dress up the sites.” At the time, I was still in search of the “ideal client.” As I reviewed the proposal and accompanying pictures, I couldn’t help but notice the run down homes, the abandoned cars, and garbage all over the vacant lots. At first, this was not appealing to the business owner in me. These locations once contained homes that have long been abandoned, and the city has taken over the sites on their own dime. The lots have long ago been razed, covered with a dusting of topsoil and the weeds have proliferated. 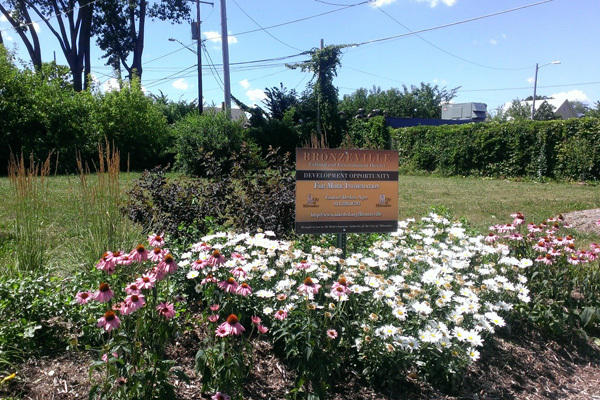 The city’s intentions were to plant trees and shrubs to help beautify the area. As I said, this was not my typical clientele so I originally decided not to bid on this work. 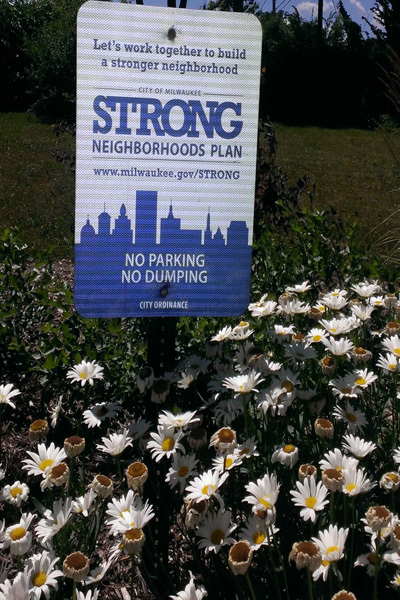 But, within the past two months I have once again been invited to bid on this “Neighborhood Strong” movement and provide the following; one time maintenance services for 16 overgrown lots, delivering plant materials to a community garden, and planting an orchard in the inner city. Giving it further thought, I decided to go ahead and bid on the work to see what this movement was all about. I can truly say that it deeply moved me emotionally, and struck a chord as a landscape architect to be providing stewardship to the built environment. Our first assignment was to deliver plant material to a community garden in a portion of the city that has a zip code with the highest rate of child poverty in the nation. Upon arrival to the community garden I was waiting for my crew to follow with the plant material, and I had the opportunity to meet the community activist who was organizing the event and garden build. He told me that the purpose of the community gardens was not only to provide food for the local neighborhood, but to provide a time on Saturday mornings to teach young children about working with the soil of the earth and growing the food from start to finish. Work starts at 8am and they perform the basic tasks of gardening, including weeding, planting, detailing, clean up, and general agricultural tasks. Each child is paid for the day of work, so instead of hanging out on the street corner, these children are learning stewardship of the land. Upon further discussion with the organizer of the community garden, he took an extra moment to introduce me to one of his associates who was starting a landscape business in the inner city who would become a good contact in the future. This experience may have been short, but very memorable for my career. 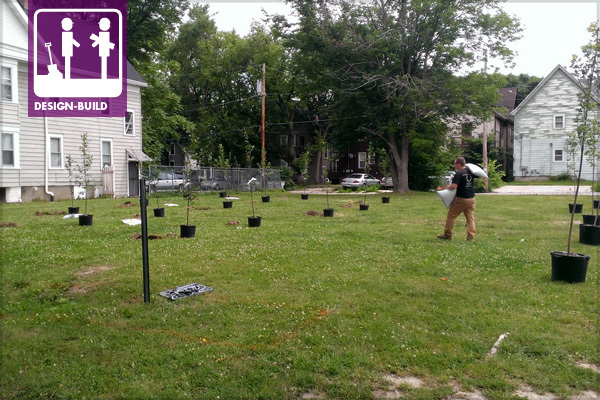 Our second project consisted of planting an urban orchard in another part of the inner city. When I originally met with the person in charge of the site, I couldn’t help but notice all of the homes that had been boarded up and the trash that had collected around the area. On the day of the planting, I decided to stay with my crew and work alongside them. Again, these were sites where old buildings were ripped down and minimal soil was in place. While digging the holes, we encountered native rock and post industrial materials such as glass, concrete, and chunks of asphalt making it a difficult task. As we continued to work, there were a handful of neighborhood children that showed up and asked what was going on. We told them that we were planting an orchard for their community and they were delighted and excited about the update. I was struck to see their excitement to have a nice clean environment in the neighborhood. 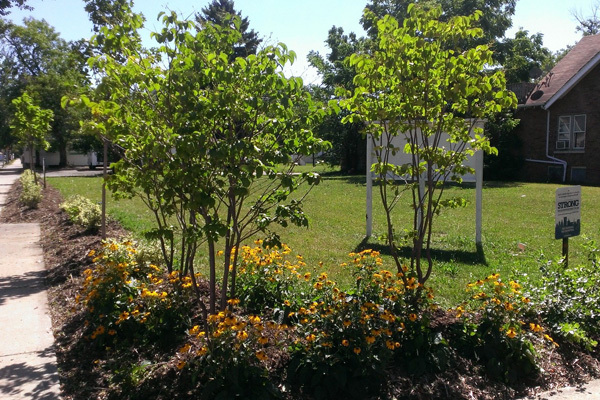 It took us several days to complete the installation of both the orchard and shade trees. After our work was complete, the community activist stopped by to share her story and history with the community. She had been in the community for 30 years and had done everything possible to get this garden/orchard in place and was extremely excited that the city had finally been able to make it come to fruition. 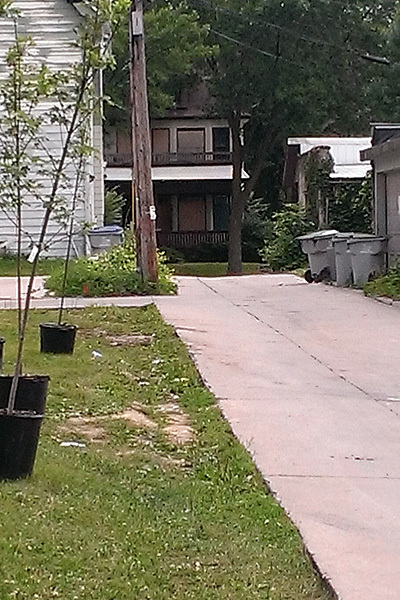 On top of supplying the trees, the city furnished her with water and hosing to help maintain the newly planted trees. I continuously found myself pondering why I was here and what I was doing for this community. Throughout the installation, active illegal activity was happening all around us as well as recent known crimes, but to see this woman (who had been in the community for 30 years) overjoyed that she finally made this urban orchard a reality was very rewarding for both the crew and me. In addition, we had several vehicles stop and thank us for what we were doing throughout the course of the planting, adding an additional sense of reward. The final project that we were awarded was to provide site maintenance to 16 different sites/lots throughout the inner city. For this project, I decided to call the gentleman that I spoke of earlier that was starting his own landscape business. I decided to reach out to him and hire him as a subcontractor to assist us in a consulting role as well as performing detail work on the lots. This was a win/win for the team, as he was very familiar with all of the different sites, but more importantly, he was eager to learn about our industry and how we play stewards to the land. We embarked on our first day and began detailing a portion of the 16 sites. The following day, my crew and I (including our new subcontractor) finished the sites in a full day of work. It was amazing to see the transformation in such a short span of time and that the concept of “Neighborhood Strong” is very vital to many communities in need. When Chris and I were able to discuss this experience, Chris stated the following comment, “Whether with municipally funded projects or volunteer opportunities – working with those in tough situations has, in my experiences, paid me back way more than the effort put in. Inner peace with having made a small difference for someone is priceless.” I can tell you that my gratification and my sense of accomplishment while working on these inner city gardens has been life changing. Unfortunately, for these areas, the challenges do not change overnight. The community must now take ownership of these gardens and keep them clean and healthy for future production. With this in mind, it is important for us as landscape architects to continue to reach out to these communities and ensure that we provide responsible planning and management of our urban resources. So in conclusion, various topics of interest in our field may come and go and what is trendy this year may not be in five years. But, stewardship of the land will have a timeless quality. It returns us to the roots of our profession and the works of Frederick Law Olmsted. I would like to put a challenge out to all of you in the design-build industry to ask yourselves what you are doing to become stewards of the land. I have always had a passion for design and pride myself in pushing quality and timeless design services for my clients, and now I look forward to continue to push and promote stewardship.